Some of you might remember texting for the first time, and thinking: “Man, I got to hit one button four times just to get the letter S, the most often used consonant”. T9 was able to remove some of that frustration by guessing what words you would type, but it has a bad habit of mixing up certain words, like texting in the word “home” would often result in the word “good”. You know how the T9 program can recognize words? 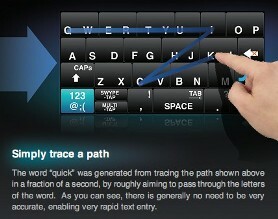 Apparently, the Swype can recognize them as well, because the user does not have to hit the spacebar. Yes, there is something in the program that can recognize words and put the spaces between them automatically. The designers of Swype are planning to focus putting their new program on Windows Mobile, but there is no word when it will be out, if at all.